From "My Dream is You" Recording date July 17th, 1995 Groundstar Studio, Nashville. From L-R: Andy Reiss, David Hungate, Chris Brown, Denis Solee, Roy Huskey, George Tidwell. Comment from April: "I moved to Nashville in 1979 as a working musician (Bass player) and in 1985 began writing songs full time and retired as a "side-man". I've always tried to surround myself with talented musicans I admire. Around 1989, I began playing out again with a band of my favorite musicians but we mostly performed songs I wrote or co-wrote. 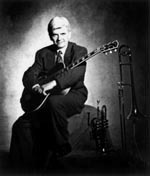 At first I was stylistically 'all over the map' playing country, swing, western swing, blues etc but I soon began to sharpen the bands focus and only played swing and jazz songs I wrote as well as a few standards and favorites. As my writing developed, I realized I had a flair for writing swing tunes that sounded like they fit right in with classic standards of the 1930s-1940s. This was a great turning point for me and as we played out in nashville, we began to attract a following. Musicians sometimes passed through the band and moved on or away as you will see by the photos. I'd always loved swing and jazz and one thing that attracted me to that idiom was the fact that "Swing" is a music full of joy and getting to listen to my fellow musicians play and improvise over songs old and new was an absolute delight." Roy Huskey. Roy was a giant of a musician. A world class genius who was known and admired around the world. I first met Roy when I moved to Nashville in March 1979. He was just a kid but already had the reputation as a brilliant and unique musician. Roy began recording with me in 1985 when I began recording demos of songs I'd written. I've always had strong ideas of musicians I wanted to work with,and of course, when I began to play out-he was the only choice! I adored him and we had a wonderful friendship. In 1996, Roy was diagnosed with lung cancer. It shocked the entire town, and people rallied around Roy and his family with support and caring. Roy fought valiently and despite every effort to save him, he passed away a scant 14 months later. It was a loss of immense proportions. To lose a one of a kind person like Roy was heartbreaking. He passed away on September 7th, 1997 at age 41. Not a day goes by that I don't think of Roy. We miss him so much. 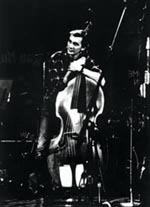 To read more about Roy, go to www.bassplayer.com. Jan.1998 issue has 2 articles on Roy and I believe there was an entire article on Roy in an earlier issue. From L-R: Matt Rollings, Neil Rosengarden and Denis Solee. 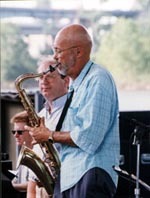 Photo is from Jazz on the River Festival in Nashville June 1998.